A few weeks ago, the Institute of Medicine (IOM) surprised many of us when it announced its new dietary reference intake (DRI) for vitamin D. The consensus of the scientific community was that the previous DRI of 400 IU was insufficient, and that supplementation with at least 1,000 IU would be necessary for most people to achieve vitamin D sufficiency. The IOM disagreed. The IOM's new recommendations call for 600 IU per day for children and adults under age 70 (formerly 400 IU; for adults over age 70, the new recommendation is 800 IU), and the tolerable upper limit (amount not to be exceeded in one day) has been raised to 4,000 IU from 2,000 IU. Their definition of vitamin D sufficiency is a 25(OH)D level of 20 ng/ml. There has been a great deal of research in recent years on vitamin D's role in a variety of human diseases. Low vitamin D status has been associated with cardiovascular disease, certain cancers, cognitive decline, depression, diabetes, pregnancy complications, autoimmune diseases and even a 78 percent increase in all-cause mortality risk (<17.8 ng/ml 25(OH)D compared to >32.1 ng/ml). However, because there are not yet enough randomized controlled trials to clearly and conclusively confirm the benefits of vitamin D supplementation for conditions unrelated to bone health , the IOM did not find the existing evidence for non-skeletal conditions sufficient enough to raise the daily recommendations any higher than 600 IU. The 600 IU figure is based solely on bone health -- they did not take into account whether a greater quantity of vitamin D might be necessary to prevent non-skeletal diseases, even though there are vitamin D receptors in almost every cell of the human body. The increase of the tolerable upper limit to 4,000 IU is a positive change. The lack of randomized controlled trials does not mean that we should ignore the epidemiological evidence showing vitamin D's importance for preventing non-skeletal diseases. As you can see, the IOM is on the low extreme, the Vitamin D council on the high extreme, and my recommendations are more moderate. What I recommend is a safe, conservative amount of vitamin D which is supported by the literature. Recent reviews by prominent vitamin D researchers taking into account several studies on hypertension and colorectal cancer (for which evidence for a beneficial effect of vitamin D is quite strong) in addition to bone health concluded that 30 ng/ml should be the minimum sufficient level, and that a desirable range was approximately 36-48 ng/ml. I agree with this. About 50 percent of North Americans have blood levels lower than 30 ng/ml. They further estimated that supplementation of at least 1000 IU would be necessary for most people to reach this desirable range. [8-10] The IOM's recommendation falls short of these figures. The IOM claims to be conservative, citing potential risks of over-supplementation, but I believe it is safer and more conservative to take the studies on non-skeletal conditions into account. The IOM with their still low recommended level of D may be taking risks with our lives here; my guidelines and D recommendations are more conservative and sensible given the strong possibility that 25(OH)D levels in the 20s may not be ideally protective, and certainly blood levels in the 30s and 40s could not be dangerous, since exposure to sunshine brings levels even higher than that. It has been my experience that most people can reach sufficiency (defined by 35 ng/ml) with a 1,500-3,000 IU dose of vitamin D. We want to assure optimal levels, not just prevent deficiencies, and supplementing with 1,500-3,000 IU still falls well below the new tolerable upper limit of 4,000 IU. Skin color, geographical location, time spent outside, sunscreen use, age etc., are all factors in how much vitamin D is produced by the skin (and therefore how much vitamin D is present and active in the body) before we take any supplements. People can differ greatly in the amount of Vitamin D required. So the supplemented dose is best determined by blood test, not by a predetermined amount set by the IOM or anyone else. Even then, the supplements we take may have varying potencies - some studies have found D2 to be less active, while others disagree. In my practice, and vast experience monitoring Vitamin D levels over the last ten years or more, I have noticed that those taking D2 need a greater number of IUs compared to D3 to reach similar 25(OH)D levels. A note on Calcium recommendations. 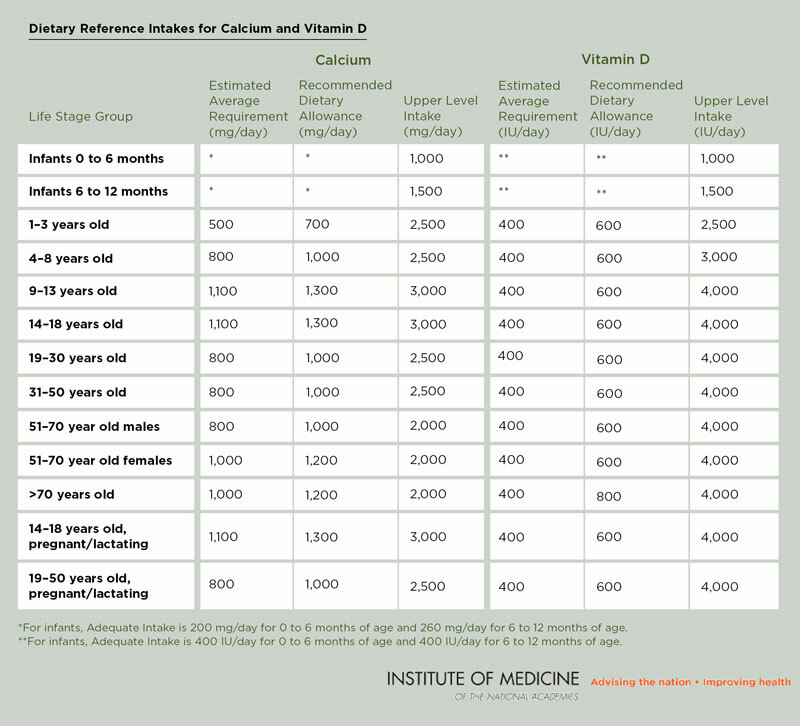 Along with these new vitamin D recommendations by the IOM came revisions of their calcium recommendations, as shown in the chart above. Much of the scientific community has also been in agreement that calcium recommendations for Americans have been too high. For example, the World Health Organization advises an intake of 500 mg, whereas the IOM recommends 1000 mg. When making calcium recommendations, the interplay with vitamin D is important. As was found in the meta-analysis by Bischoff-Ferrari and Willett, vitamin D supplements in the range of 792-2000 IU were required to protect against osteoporosis-related fracture, demonstrating the inadequacy of the IOM's recent pronouncement. However, the most interesting finding here was related to calcium: low dose calcium supplementation (500 mg) combined with vitamin D supplementation reduced osteoporosis fracture rates, but high dose calcium supplements (1000 mg or more) combined with vitamin D supplementation did not. [3-5] These results suggest that high dose calcium blunts the beneficial effects of vitamin D. Furthermore, a recent meta-analysis has revealed that there is potential for cardiovascular harm from taking high dose calcium supplements. I advise caution here - conventional (high) levels of calcium supplementation (above 1000 mg) are not only unnecessary, but may even be counter-productive. If you do not yet know your 25(OH)D levels, approximately 2000 IU is a reasonable dose of vitamin D to take until you can get your levels tested. 1. Melamed, M.L., et al., 25-Hydroxyvitamin D Levels and the Risk of Mortality in the General Population. Archives of Internal Medicine, 2008. 168(15): p. 1629-1637. 2. Zhang, R. and D.P. Naughton, Vitamin D in health and disease: Current perspectives. Nutr J, 2010. 9(65). 3. Bischoff-Ferrari, H.A. 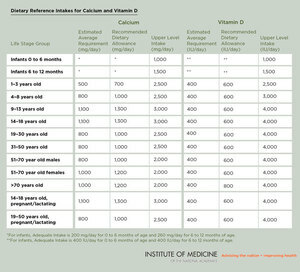 and W. Willett Comment on the IOM Vitamin D and Calcium Recommendations. Harvard School of Public Health: The Nutrition Source, 2010. 4. Zoler, M.L., High Vitamin D Intake Linked to Reduced Fractures. Family Practice News, 2010(November 16, 2010). 5. Bischoff-Ferrari, H.A., Orav, E.J., Willett, W. et al., A Higher Dose of Vitamin D is Required for Hip and Non-vertebral Fracture Prevention: A Pooled Participant-based Meta-analysis of 11 Double-blind RCTs, in The American Society for Bone and Mineral Research 2010 Annual Meeting2010: Toronto, Ontario, Canada. 6. Vieth, R., Vitamin D supplementation, 25-hydroxyvitamin D concentrations, and safety. Am J Clin Nutr, 1999. 69(5): p. 842-56. 7. Cannel, J.J. Vitamin D Council Statement on FNB Vitamin D Report. 2010. 8. Bischoff-Ferrari, H.A., Optimal serum 25-hydroxyvitamin D levels for multiple health outcomes. Adv Exp Med Biol, 2008. 624: p. 55-71. 9. Bischoff-Ferrari, H.A., et al., Estimation of optimal serum concentrations of 25-hydroxyvitamin D for multiple health outcomes. Am J Clin Nutr, 2006. 84(1): p. 18-28. 10. University of California - Riverside (2010, July 19). More than half the world's population gets insufficient vitamin D, says biochemist. ScienceDaily July 28, 2010]; Available from: http://www.sciencedaily.com/releases/2010/07/100715172042.htm. 11. Holick, M.F., et al., Vitamin D2 Is as Effective as Vitamin D3 in Maintaining Circulating Concentrations of 25-Hydroxyvitamin D. Journal of Clinical Endocrinology & Metabolism, 2007. 93(3): p. 677-681. 12. Bolland, M.J., et al., Effect of calcium supplements on risk of myocardial infarction and cardiovascular events: meta-analysis. Bmj, 2010. 341: p. c3691.